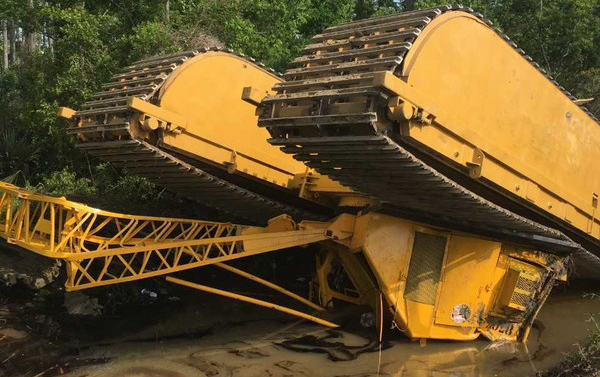 According to NOLA.com the operator of a crane installing sheet piling along a drainage canal in Old Mandeville Thursday morning (April 19) had to be rescued after the crane overturned in the water and trapped him in the submerged cab. The operator was transported to a local hospital where he was in reported to be in stable condition, according to St. Tammany Fire Protection District 4. The accident occurred around 9:15 a.m. on a canal just west of West Avenue. The operator, who was not identified, was using the crane to place metal beams along the bank of the canal to build a bulkhead, said Jeremy Windom, fire prevention and public information officer for the fire district. The tracks of the crane apparently got too close to the canal bank, causing the weight to shift and tipping the machine over into the canal, he said. Co-workers pulled the operator out of the cab and fire district personnel loaded him onto a stretcher and transported him to the hospital. Windom said the operator was conscious when he was pulled from the canal. A minimal amount of diesel oil was spilled into the canal, which drains into Lake Pontchartrain. The oil was contained to the area and the Coast Guard was notified, Windom said.